Guests enjoy views of Camel's Hump & the Green Mountains. We share an entrance, otherwise the Guest Studio is very private. This space is great for couples, solo adventurers, & business travelers. My home was built in 1810 & the Guest Studio was added onto the house in 1980. Monkton is conveniently located midway between Middlebury & Burlington. Ski Areas: Monkton Vermont is about 45 minutes from Sugarbush, Mad River Glen, Bolton Valley and Middlebury Snowbowl. Less than an hour from Stowe. I own a small catering business. In my spare time, I love to garden, hike and ski. I've lived in Vermont for about 25 years and know quite a bit about the surrounding area. There's so much to see in the surrounding area- Apple Orchards, Breweries, Lake Champlain and the hiking in nearby mountains. Monkton is an easy drive to Burlington, Middlebury... kind of a mid way point for site seeing. We share an entrance but the apartment/studio is very private. Really roomy - perfect for solo travelers or couples- both for business or vacation. Super views of the Green Mountains. No tub but nice shower. Towels provided. Wood stove is in living room but we ask guest not to use. We loved our stay here and are already planning our return. The studio was clean and very comfortable. The views from the picture window are so serene. We found everything we need in and around Monkton. Amy was a terrific help when it came to things to do in the area. We wouldn't have gone to the Shelburne museum without her advice. Citizen Cidery was also a big hit. We ran out of time for some of the hikes but will make them next year. Oh, the garden overlooking the lovely rolling hills is just wonderful. Amy kindly invited us to pick some luscious raspberries for breakfast. Yum! It was great! She helped us with places to go to eat and fun things to do during the day. Beautiful view and nice outdoor sitting area. Thanks so much for your nice review! Would love to host you again when you return to Vermont for a future vacation! We loved this place, which gave us plenty of room and privacy. It is conveniently located for Burlington, for hiking, and for dining. It is also close to other towns which we hope to explore on a future trip to Vermont.The space itself is charmingly decorated, and being there was definitely one of the nice memories of our Vermont vacation. Our hostess Amy gave us hiking and dining recommendations, as well as general sightseeing tips. The pool was so nice, especially after a day of hiking. 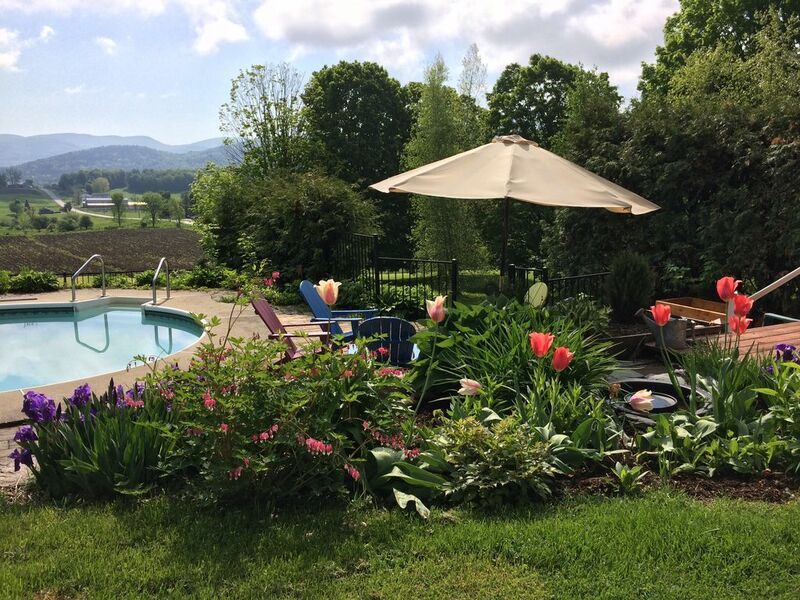 We highly recommend this beautiful spot, which also has a view that is quintessential Vermont. What a great space and great owners. We felt right at home there. The view was amazing and I found myself looking out the window and feeling relaxed. Cozy and lovely and spacious apt -- and a refreshing change from sterile hotel rooms! Amy was so welcoming and gracious, and her property was perfectly located for us in the Burlington, VT, area. She had taken the time to write out helpful restaurant suggestions, where to buy breakfast goodies and snacks, and went out of her way to serve as a liaison for us with possible venue for our son's wedding rehearsal dinner. Have I mentioned her backyard pool yet? Refreshing swims in a private pool were an added bonus to our stay during a heat wave. And picking raspberries off the vine in Amy's backyard before breakfast was also a great way to start the day. Thank YOU! Enjoyed my stay despite the weather. Amy was friendly and welcoming. Appreciate her willingness to help if needed. Would visit again. Please visit again if time permits before you head to Arizona!